The Sevenoaks 7 2019 is now confirmed for July 14th at 10:30 under new race director Richard Thomas. Competitors praise the event for its friendly atmosphere, efficient organisation and a chance to compete in the beautiful Knole Park. Or download a postal entry form in Word or PDF format. Race Notes are here. Course Map is here. A5 Flyer is here. The race is sponsored by Up & Running, Sevenoaks, and will raise funds for the Dame Kelly Holmes trust, to help disadvantaged youngsters in Kent to get their lives back on track. 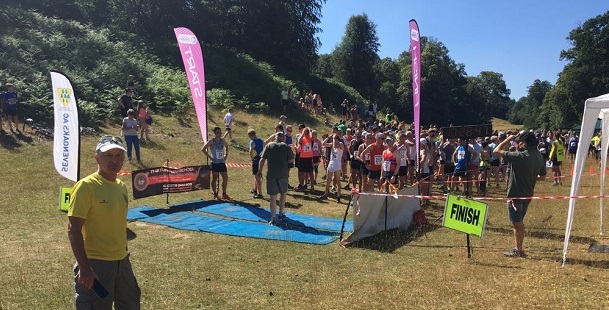 The 25th Sevenoaks 7 took place on Sunday July 15th in exceptionally hot and sunny conditions. The runners were advised to hydrate well before competing and extra water supplies were laid on at the registration, half-way point and the finish. All the marshals carried emergency water supplies, but fortunately there were no emergencies. The 241 runners finished hot and tired, but most claimed to have enjoyed the event. The race was won in a very fast time of 41.44 by Daniel Pink from Orpington. Pink said that he actually enjoys running in the heat. In second place was last year’s winner, Stephen Hodge, from Cambridge Harriers and in 3rd place local Sevenoaks AC athlete, James Mason, who won the race in 2015. The women’s race was won by Becky Morrish of Paddock Wood in 50.31, closely followed by Sevenoaks AC athlete Heather Fitzmaurice in 51.02 and Susan McDonald of South London Harriers in 52.40. Sevenoaks AC men's team of James Mason, Andrew Milne, Lee Lintern and Andrew Hutchinson claimed the team prize ahead of Orpington Road Runners. The women's team winners were Paddock wood AC (Morrish, Mandy Barker and Alison Fullick). Joshua Hobbs won the accompanying junior race, with Lexie Johnson first girl. Competitors praised the event for its friendly atmosphere, efficient organisation and a chance to compete in the beautiful Knole Park. The race was sponsored by Up & Running, Sevenoaks, and raised funds for the Dame Kelly Holmes trust, to help disadvantaged youngsters in Kent to get their lives back on track. Thanks to all who took part. The results of the main race are here. Junior race results are here. 25 Years of the Sevenoaks 7 is here. Read more in RunABC report here.